This mix of heirlooms includes a rainbow of several Brassica species for a salad mix. All have been chosen to provide an assortment of flavors, colors, and textures. 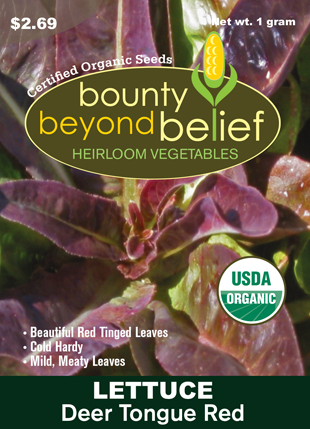 Use all leaves when young and tender in fresh salads or braised or sauteed. Microgreens are generally harvested at the first-true-leaf stage of growth. This mix can be grown in a greenhouse with supplemental heat or Indoors with lights, to produce microgreens throughout the entire year. This mix of heirlooms includes a rainbow of several Brassica species for a salad mix. All have been chosen to provide an assortment of flavors, colors, and textures. Now you can be just like the fine dining chefs by using microgreens to enhance the attractiveness and taste of your dishes with their delicate textures and distinctive flavors. Use all leaves when young and tender in fresh salads or braised or sauteed. Microgreens are generally harvested at the first-true-leaf stage of growth. This mix can be grown in a greenhouse with supplemental heat or Indoors with lights, to produce microgreens throughout the entire year.